If you’re reading this post, you probably know that dental implants are the most effective form of tooth replacement. That’s because they mimic natural teeth. Artificial root – A root form, usually made of titanium, is surgically implanted in your jawbone. It’s a simple procedure. Abutment – This connector is attached to the artificial root to support a crown. Dental crown – A dental crown is attached to the abutment. 1. What are the implant dentist’s qualifications? 3. What’s involved with getting dental implants? 4. What Are My Long-Term Goals for My Smile? If you have multiple smile goals, dental implants can be added to the treatment plan. But timing is everything. Your dentist will let you know at what stage dental implants will be scheduled in your overall treatment. For example, if you want your teeth whitened or aligned, let you dentist know before you receive dental implants. 5. Am I Willing to Wait? Surgery and healing – Receiving dental implants is a process. After the implants are placed, it takes three to four months for the implants and your jawbone to fuse and provide a solid anchor for dental crowns or dentures. Meanwhile, you will wear temporary crowns or dentures. Bone grafting – If some of your teeth have been missing for an extended period, your jawbone might be shrinking. Adequate bone is needed to support dental implants. If you don’t have enough bone, grafting might be required. The grafts need to heal before dental implants are placed. A successful outcome requires patience. Don’t expect a quick fix with dental implants. 6. Am I Willing to Consult with More than One Dentist? Much of the success of dental implants depends on the training, skill, and experience of the dentist. We recommend that you schedule consultations with more than one dentist. Only schedule consultations with providers who have post-graduate training in implantology, years of experience in placing implants, and many patients for whom implants have been provided. Cost alone should not determine which provider you choose for dental implants. Compare all of your options and weigh them carefully. If you’re thinking about getting dental implants to replace missing teeth, they are the most natural-looking and effective solution. People who smoke can still be candidates for dental implants, but you should know the risks involved. Nicotine causes blood vessels to narrow and limit the blood flow to organs and tissue. Sufficient blood flow is needed for proper healing around dental implants. If you smoke, the healing process can be delayed. Nicotine binds to tooth roots and affects the health of roots, ligaments, and gum tissue. Compromised tooth roots and ligaments can decrease the stability of teeth and loosen them. Gum disease causes the tissue to pull away from teeth and create pockets where bacteria can leak in. If you develop bacteria in your gums around dental implants, healing will be difficult. The placement of dental implants requires small incisions in your gum. These surgical sites need to heal properly. Your body naturally fights infection, but if you smoke, your immune system is suppressed. It will be more difficult for your body to fight infection if any bacteria get around your dental implants. e-cigarettes and vaping release a high concentration of very hot aerosols and smoke in your mouth. This exposes your gum tissue to burning, dryness, and chemicals that can inhibit the healing process. Receive dental implants anyway – Many dentists and oral surgeons will still provide surgery if you smoke. They simply inform their patients of the risks. Others will recommend that you stop smoking a few weeks before implant placement. Stop smoking – You can choose to stop smoking several weeks before and after implant placement. Some patients have asked their primary care doctor for help to stop smoking. Temporary alternatives – If you need time to stop smoking, a partial denture or some other form of temporary tooth replacement might be available. Permanent alternatives – Dentures, a dental bridge, or a partial denture are alternate forms of tooth replacement. Although they don’t last as long, a skilled cosmetic dentist can provide natural-looking results. If you’re interested in dental implants, schedule at least two consultations with different dentists who have advanced training and experience in placing implants. In complex cases, many dentists partner with an oral surgeon for implant placement, and the dentist provides the implant crowns. This post is sponsored by Lowell, MA implant dentist and accredited cosmetic dentist Michael Szarek, DMD. 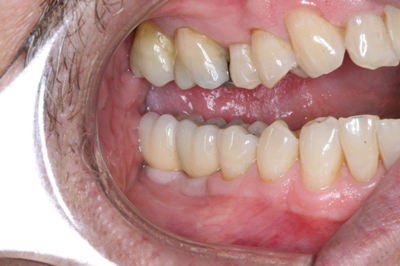 The before-and-after photos below show how Dr. Szarek places dental implants and restores them with dental crowns for natural-looking results. Should you request titanium or zirconia dental implants? If you need dental implants, should you request titanium or zirconia implants? Consider a few facts about your options. The first titanium dental implant was placed in 1965. Since that time, there has been extensive research on titanium implants for their efficacy and biocompatibility. Titanium is also commonly used for joint and bone replacement throughout the body. Although titanium isn’t essential for life, it has proven to be biocompatible with human oral tissue. A study published in the September 2018 issue of Clinical Oral Investigations shows that the success of dental implants is largely dependent on professional maintenance and practicing excellent oral hygiene at home. Patients who received follow-up care every three months after initial placement of an implant showed minimal signs of inflammation around the implant within the first year. Zirconia implants were first used in 2005. In 2011, they were approved by the FDA for use in the USA. Zirconia, or zirconium dioxide, is a high-strength ceramic. Its recent introduction into implantology means that less research is available than with titanium implants. Additionally, since the technology is relatively new, fewer dentists and oral surgeons place zirconia dental implants. 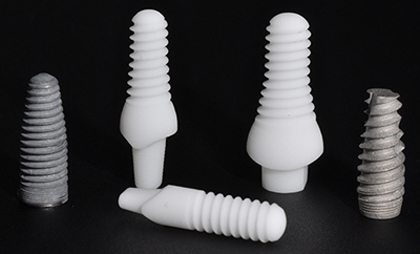 Zirconium implants are white, so over time, they are more aesthetically pleasing than titanium, which can show through as a dark line at the gumline. Even if you choose titanium, a skilled cosmetic dentist will ensure you receive natural-looking results. How Do Titanium and Zirconia Compare for Oral Health? A 2016 study published in Clinical Oral Investigations compared zirconia and titanium implants. Plaque index (PI), gingival (gum tissue) index (PD), probing depth (PD), and bleeding on probing (BOP) were examined in dental implants that had been integrated with the bone for at least 1.2 years, but on average 2.2 years. GI, PD, and BOP were higher around dental implants than around natural teeth. But no significant difference was found between zirconia and titanium implants. Schedule consultations with at least two skilled implant dentists to discuss your concerns. At least one of the dentists should have extensive experience with zirconia implants—or partner with an oral surgeon who has the experience. If you think you have metal allergies or sensitivities, schedule an appointment with an allergist to find out if titanium will present any issues. Depending on the number of teeth you’re replacing with dental implants, the implants will be restored with dental crowns or dentures. Find a cosmetic dentist to provide lifelike crowns or dentures. Dental implants can be a lifelong solution for replacing missing teeth. But care must be taken to ensure precise placement and adequate bone support. Sometimes sinus perforation occurs during dental implant surgery. What can be done to prevent it? And what should you consider if it’s already happened to you? 1. Is Perforating Sinuses a Big Deal? Some oral surgeons say perforation of your sinuses during dental implant placement isn’t a big deal. They say that if it happens, the site usually heals well and the patient is fine. Other oral surgeons will mention cases where, after perforation, an infection from the sinus cavity spreads around the dental implant. Sometimes, chronic sinus infection results, making it difficult to keep the tissue around an implant healthy. 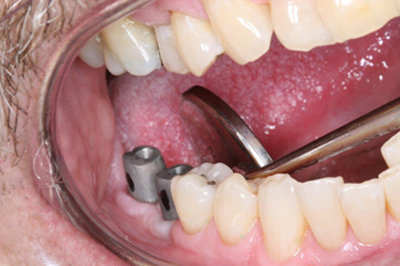 The issue of sinus perforation during dental implant placement also raises the question: If the dental implant pokes into the sinuses more than one or two millimeters, is it adequately supported by the jawbone? And will inadequate bone support by the bone contribute to dental implant complications or failure? Dental implants need enough bone to fuse to and remain stable. High-quality implant surgery requires the surgeon to take x-rays. Most successful oral surgeons use three-dimensional x-rays to ensure there is enough bone density to support dental implants and maintain stability. 3D x-rays will also reveal your facial structure, nerves, and sinus cavities and assist in performing surgery with precision. 3D x-rays help anticipate the need for sinus lift, or sinus floor elevation, and bone grafting before dental implants are placed. A 2010 article in the Journal of Oral implantology reports that in one study of patients who received minimally invasive sinus lift surgery, there was a 97% implant success rate. 3. Have You Experienced Issues? If you’ve received dental implants and are experiencing problems from sinus perforation, don’t ignore it. Your oral surgeon or implant dentist should communicate to you a clear plan to ensure the problem doesn’t get worse or result in dental implant failure. If you lack bone density to support dental implants, the solution will likely include a sinus lift, or sinus floor elevation, and bone grafting. After you speak with your dentist, we suggest that you consider scheduling an appointment for a second opinion. A dentist with advanced training and experience in implantology, an oral surgeon, or a periodontist can review your x-rays, and examine your implant site to determine the issues involved and recommend treatment. Will insurance pay for a tooth implant if a tooth gets knocked out? As you likely know, losing teeth is common for hockey players. Many players who have lost a tooth have obtained a removable form of cosmetic tooth replacement. They take the appliance out before games. Some only use it for special occasions. Contact your insurance company and ask if limited benefits are offered for dental implants. Generally, insurance will provide benefits for the least expensive form of tooth replacement. Dental implants are the most effective and most expensive form of tooth replacement. Partial denture – A partial denture has one or more teeth attached to a gum-colored base. It clasps onto adjacent teeth. It is the least expensive form of tooth replacement. Dental bridge – A dental bridge requires shaving down the natural tooth on either side of the missing one. The replacement tooth is suspended in the middle of the bridge, and a dental crown is connected to the right and left of it. The crowns on the ends are placed over the shaved down natural teeth. 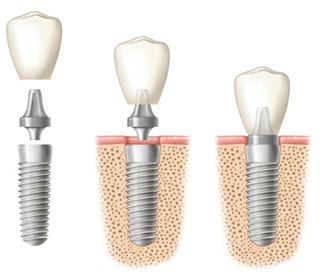 Dental implant – An artificial root form, usually made of titanium, is surgically implanted in the jawbone. After a healing period of three to four months, a dental crown is attached to the implant. If you play contact sports and experience an impact to your face, the dental implant can loosen and fail. This is the most expensive form of tooth replacement. And What Can You Do? Do what you can to avoid needing a dental implant. Consider the follow precautions. Customized mouth guard – Wearing a customized mouth guard can help. It’s important that you receive a mouth guard from your dentist. Impressions of your teeth will be taken to make it. But a mouth guard has limited benefits if a hockey puck or stick makes an impact with your mouth. Full-cage mask – With a highly-interactive sport like hockey, only a full-cage mask attached to the helmet will prevent objects from impacting your face. This is not a popular option among players, but it provides maximum protection for your face and teeth and can help save a tooth and avoid the need for a dental implant. Keep the tooth moist – If you lose a tooth, keep it moist with saliva or milk. Of course, if you’re in the middle of a game, milk probably won’t be within reach, so use your own saliva and see a dentist right away. This post is sponsored by Michael Szarek, DMD, a Lowell, MA accredited cosmetic dentist.